Note: This post first appeared August 3, 2012; the recipe has been edited slightly to include some additional notes, a quick video on how to make this paleo almond zucchini bread along with updated photography. The text is original and 4 years old but, I assure you the paleo almond zucchini bread is still killer. Subscribe to Running to the Kitchen on YouTube for more easy how-to videos. This paleo almond zucchini bread is slightly crunchy on the outside and super moist on the inside. It’s the perfect way to use up summer zucchini. Hypocritical: Making this paleo almond zucchini bread the other day and then eating pasta for lunch. And that’s why I don’t do diets. It was Barilla protein plus pasta though at least. Pretty much everyone makes zucchini bread around this time of year. They run the gamut from super savory to sickly sweet as people try to justify it as healthy because it’s got vegetables in it. Yeah, that cup of sugar is totally balanced out by the grated zucchini, keep telling yourself that. I actually think the coolest thing about the paleo diet is playing around with baked goods. It’s a challenge and when I can win them, I like challenges. When I fail and I can only push press 65 pounds while everyone around me is doing at least 25 pounds more than that, I get frustrated and want to throw things. Luckily, the weights in Crossfit are rubber and the paleo bread turned out awesome so no knives were flying around the kitchen. I got lazy making my almond flour and definitely didn’t grind it as fine as I should’ve. It resulted in the best texture though, think somewhere between chopped nuts and sifted flour. Crunchy, but not too much that it doesn’t feel like bread. Contrasted with the moistness from the zucchini…perfection. I’m totally amazed at how paleo breads even work. Like how do ground up almonds actually rise in the oven? I know that baking soda has something to do with it (obviously), but it just seems like a hell of a lot of work for the poor baking soda compared to traditional flours. I guess I don’t really care though as long as this is the result. 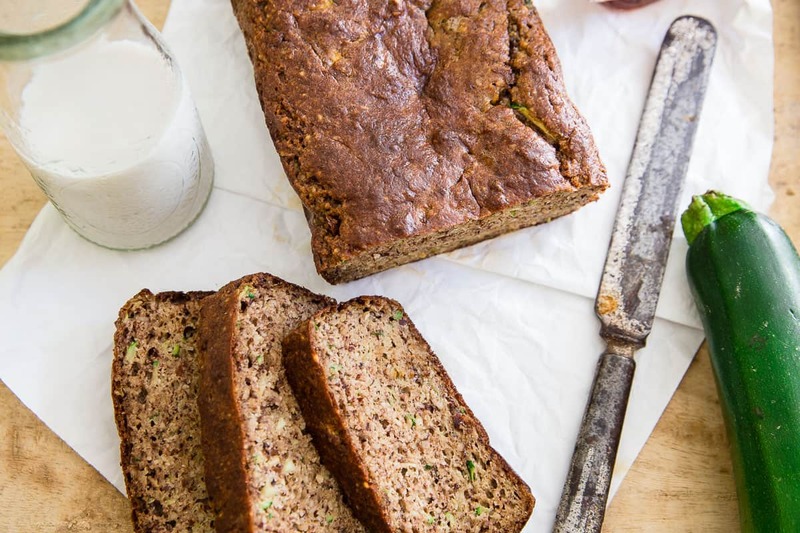 ps- spread some of spicy chocolate walnut butter on a slice of this paleo almond zucchini bread and omg, it’s like an explosion of nutty goodness. This paleo almond zucchini bread is slightly crunchy on the outside and super moist on the inside. It's the perfect way to use up summer zucchini. Preheat oven to 350 degrees and line a loaf pan with parchment paper. Add wet ingredients except zucchini and whisk until thoroughly combined. Add zucchini and stir until combined. Bake for about 35 minutes until top is browned and center of the bread is set. Remove from oven and let cool in the pan on a wire rack for 5 minutes. Remove bread from loaf pan by pulling on the sides of the parchment paper and place back on the wire rack to cool fully before slicing. What a great bread recipe! I think I’ll whip it up before I go to work today! Have a great weekend!! Yet another zucchini recipe I’m collecting. Tomorrow I load up at the farmers market! I have four mushy bananas just begging to be made into a bread. I think this is going to be the bread! This looks like it has a really great texture, I love using magical ground almonds in baked goods. I’m with you. I love a lot of the paleo recipes but I could never give up grains completely. I did the same thing the other day. I ate paleo pancakes, a huge salad for lunch and a big old bowl of pesto pasta for dinner :) Balance right? 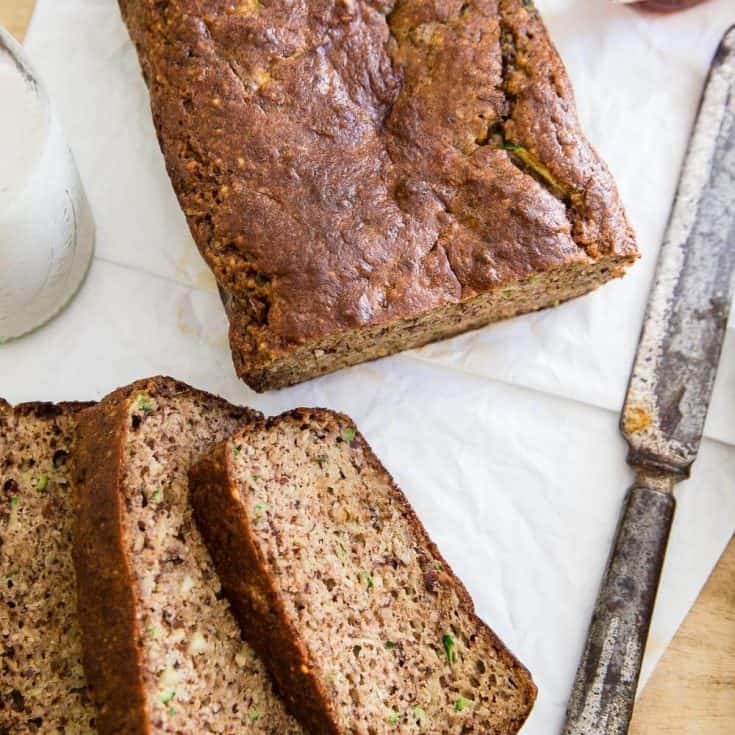 funny you posted this – I was just reading your banana paleo bread the other day when i clicked over from your sidebar and now this one – makes me wanna bake some bread! Hope you’re having a blast at BlogHer! ah yes crossfit can be frustrating at times… there will ALWAYS be someone (or lots of people) better, but I try to focus on myself and the progress I’ve made. And paleo bread confuses me too, which is why I usually don’t even bother! Good job cracking the code though, it can be tricky. my sister will flip over this! she’s celiac and dairy-intolerant so she basically HAS to eat paleo, but does it because she loves it. i know she misses baked goods though…this will be perfect for her! It’s not a plugin in actually. I used to use the “pin it on pinterest” plug in but it severly impacted my site’s load time so I deleted it. If you go to pinterest, under the about button is the “pin it button”. Scroll down and you’ll see 3 fields to enter the url of the picture you want the button under, the url of the post it’s on and a description. You type that all in and it gives you html code. Copy & paste into your blog and the button shows up. So I do it manually for each post. I think if you want it under a specific picture thats how you have to do it, all the plugin ones only show up on the top or bottom of the entire post. That texture does look awesome!!! Haha, make the baking soda work out as hard as you do! I love cooking with flavorful almond flour. Really a great combo Gina! Love to try this one, as always. Mmmm, this looks great. I’ve been out of almond flour for way too long. It’ll be the first thing I grab next time I’m at Trader Joe’s. i love how dense yet incredibly moist this looks! This looks so tasty, the texture looks incredible. They look like decent sized slices too – I hate just getting a sliver of cake! I have to tell you that your bread is in the oven right now! I love that there is no sugar, just maple syrup! You got that right when you said people who think it’s healthy when you add a cup of sugar! Who needs all that sugar? Can’t wait to try your bread out! Wow! Love this recipe and your blog…you crack me up with your sarcasm and funny sayings. Anyway, I just made this bread and it didn’t turn out well. I added another banana for sweetness, omitted the maple sugar and used a chia egg in place of the regular egg. Baked for 35 minutes. got all poofy in the oven and then deflated as soon as they came out. Seem undercooked and gooey. Will have to scoop them into a bowl and eat that way. Any ideas on what went wrong? Christine-thanks for the kind words. To be honest and forward though, yes, I do know what went wrong…you didn’t follow the recipe. There are 3 eggs in it and I’m not sure a chia egg is a great substitution. Paleo baking is hard enough as is, if you mess with the ingredients I can’t promise what it’s going to turn out like. I can assure you if you follow this recipe (that I’ve made 3 times now) you’ll get a very moist, dense and hearty bread. Also, make sure you bake it in mini loaf pans to help avoid the deflation thing. Mine deflated slightly when I pulled it out but it didn’t affect the texture of the bread. If it’s too undercooked/gooey, leave it in a few more minutes as all ovens are different. Although, the substitutions you made could also be contributing to that. Thanks for the quick reply. Yeah, Iam sure the omitting of the eggs had a lot to do with it…I plan to make this again soon and will follow the recipe exactly!! :) I added the chia for it’s nutritional value and I added some ground flax as well. After they cooled and were refrigerated, they firmed up quite a bit, not enough to cut into slices though. I plan on eating this in a bowl with blueberries and some non dairy milk for breakfast. I love the taste and texture of this recipe. Also, I did use mini muffin pans and will use them again as mentioned. Hi all, first off this is a wonderful bread! I modified it a bit to my likings by adding about 2 tsp of pumpkin spice (my favorite part about the flavor of zucchini bread) and 2 tsp of cinnamon- let me just tell you, I’m so glad I did this as the flavors came out absolutely delicious. I also added 1/2 cup of chopped walnuts, 1/2 tbsp of vanilla extract, 1/2 large grated carrot, and an extra tbsp of maple syrup; I also folded in my egg whites (which gave great rise to the bread). The only thing I plan to do different next time is either use less salt or just add 1 tsp of baking soda (it was a little more salty than I would’ve liked it to have been even though I put in extra maple syrup, it also browned pretty dark on top) so I’m going bake it at 315 for 45-50 minutes as it was super moist in the middle of the bread, almost wet (a quality some people absolutely adore in sweet breads but I prefer mine to be as close to traditional bread as possible). Anyhow, such delicious flavors… I can’t wait to share this with my friends at church tomorrow. Yum! I’d love to hear if the lower baking temp reduces the browning for you. Every time I bake with almond flour it turns very brown so I was thinking it was just how the flour bakes rather than the temp, but if you get a lighter result, let me know! Glad you liked it and love all your substitutions! This by far was the best Zucchini bread I’ve made yet! So good in fact I’ve got three in the oven to share with my family members! Awesome taste and CONSISTENCY! I substituted the maple syrup for Stevia. Thanks for sharing! How much stevia did you use to replace the 3 tbsp of maple syrup?? Thanks!! Would using raw honey instead of maple syrup work with this recipe? I have a giant container of honey that I need to use! I’m sure it would. They’re usually interchangeable but I haven’t tried it so I can’t tell you for sure. It’s such a limited amount, I’m sure it would be fine. The bread ended up tasting great but being way too moist. Any advice? Maybe I didn’t dry out my zucchini enough?? Probably need to squeeze the zucchini dry a bit more but it is a very moist bread. I just tried this recipe, and the flavor is absolutely delicious; the perfect cross between savory and sweet. However, I had the same problem as Meagan. My bread came out way too moist; I drained my zucchini really well, first pressing it between 2 cutting boards with paper towels, then squeezing it again with more paper towel before I added it in. I also baked it for about 45 minutes instead of the 32-35. This is a problem I have frequently with paleo baked goods (the muffins I made yesterday did the same thing). Any words of wisdom? I would just bake it for longer, but then the top gets too dark/dry. I have discovered that with many of my almond flour/paleo recipes, they come out too moist (seemingly under baked) UNLESS I separate the eggs, whip the whites into STIFF peaks, then fold the whites into the batter. In doing this I’ve virtually eliminated this issue and my baked paleo goods rise and don’t fall back in. I made this in an 8.5″ loaf pan and it rose and didn’t fall back in. I also spread my shredded zucchini on un-papertowels, sprinkle with a wee bit of salt, and let them wet in a warm oven for a bit before I wring them out. This ensures that you get out as much of the liquid as possible. I hope this is helpful! This recipe turned out BEAUTIFULLY….both in the texture and flavor! I can’t wait to try this recipe, as I am on a strict paleo diet for two months! Oy. I’m not allowed to have any form of sweetner-except for stevia-which I do not like. Any recommendations for alterntaive ways to sweeten the bread without changing the consistency? (I was thinking of using dates). Thanks! Can you please tell me how many calories is in this loaf? I just ate half in one sitting! Deliscious! Thank you. I’ve never used hazelnut flour, so I don’t know on the amounts but I’d imagine it would work pretty close to the same. Munching on these right now! I agree that this bread has a moist texture, but not unpleasantly so. I baked these as 12 muffins, for 25 minutes, and drizzled them with agave syrup before eating because I have a sweet tooth. Really pleased with how this recipe turned out, and I’m excited to experiment with it (I think it would be great with semisweet choc chips). Thanks for sharing! Love this recipe! I did make some modifications due to some of the reviews and the fact that I only have ONE mini bread pan. I decided to make muffins in silicone muffin cups. The slight adaptions I made to the recipe are: adding 1.5 teaspoons of apple pie spice in addition to the 1 teaspoon of cinnamon. I also added 1.5 teaspoons of vanilla extract and 1/4 cup of mini dairy free chocolate chips. I took handfuls of the shredded zucchini and squeezed each handful very well. The recipe made exactly 12 perfect muffins which baked at 350 degrees for 20 minutes. Thank you for sharing! Great recipe– am always on lookout for truly low-sugar baked goods recipes for my young children–and gluten free so I can enjoy! Per previous comments, I also added shredded carrot, vanilla, pumpkin pie spice and halved the salt. I used mini bundt molds since I didn’t have mini loaf pans. Smashing success… super delicious, just sweet enough, perfect moist texture, quite reminiscent of banana bread. Thanks so much! I’m from the UK, and zucchini bread isn’t so popular here as in the US. This last week I’ve been attempting to follow the Paleo diet, but I find it hard. I do not like eatiing so much meat and fish. I’ve longed for a simple salad with a couple of slices of good bread, but grains do not appear to suit me hence trying out the Paleo diet. 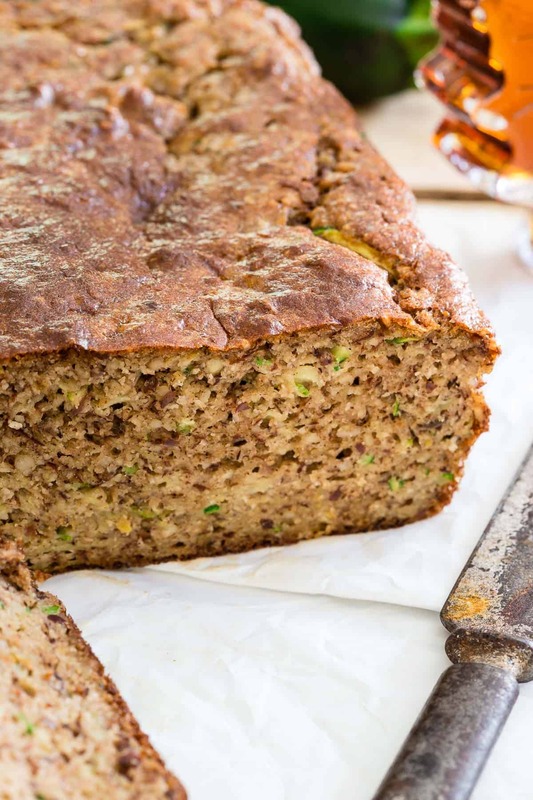 Is the zucchini bread savoury or sweet? And what are the measurements of the mini loaf tins? 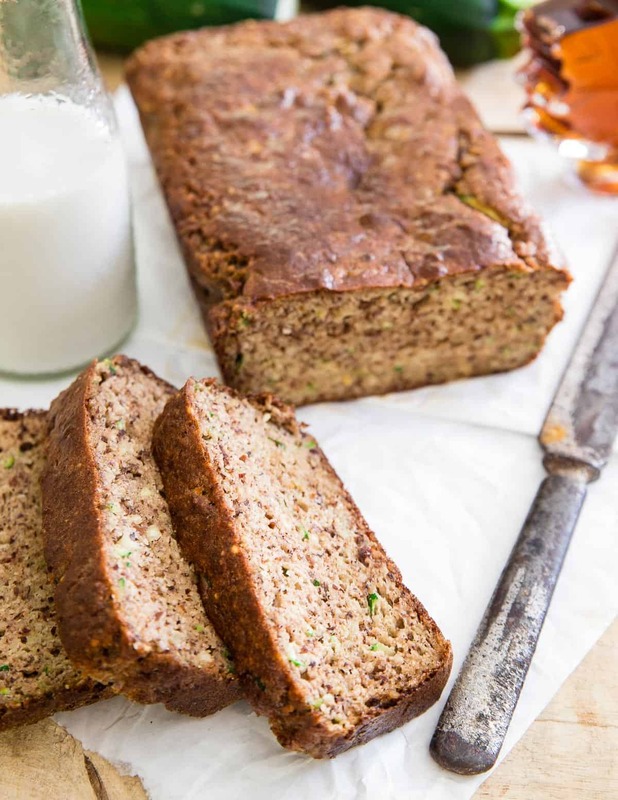 Pingback: Almond Meal Paleo Bread (with Zucchini) | Skinny Fat. I have been trying to help my husband, who knows nothing about nutrition, to lose weight. I’m trying to explain to him the idea of the paleo way of eating. I stumbled across your blog a few days ago as a result. It’s SO awesome, the recipes look great and I’m happy I’ve found it. The only thing is – it’s really hard to see the size of the loaves. I’m not a great cook but it seems to me a mini loaf tin could be many different sizes. Could you put the size of the tin in please? I find that recipes are often vague – like when it says ‘1 mashed banana’ – is that a big banana, little banana, medium banana. It would be helpful to have an idea of how much recipe writers mean when they say a certain amount of a vegetable or fruit. Does this recipe work with Bob’s Red Mill Almond Flour? Just curious because there is another blog I follow with Almond Flour Recipes and she says Bob’s Red Mill Almond flour is too course. Thanks for the Recipe! I used Agave Nectar instead of Syrup and added 1 teaspoon vanilla…Delicious!! This was so good. We left out the banana and put in 1/4 cup maple. The sweetness was subtle, but oh so good. Thanks for the great recipe! I don’t normally post when I try a recipe, but Dear Lord woman this recipe is the BOMB! I’ve had disaster after somewhat edible disaster with grain free breads, but I’m pretty sure that I’d eat this entire thing just to make another one so I can eat that. I only made a few tweaks- subbed in 1/4 cup coconut flour instead of all the almond flour (almond flour is expensive and i’m cheap) added cinnamon, ground nutmeg, ground cloves, and a tiny bit of raw maple sugar. I used silicone cups to make muffins because I don’t have mini loaf pans- cooked on 350 for about 30 mins. Oh and I sprinkled slivered almonds on the top for more of a crunch. Not to mention that I literally wrapped the zucchini between paper towels and stood on it to squeeze out the water. Even my husband was like these are delicious. Well done sir, well done. I made these for my son who has fructose malabsorption. I skipped the maple syrup all together since it doesn’t work for his diet. I made muffins and they were great. I froze some too & they thawed well for later. Great way to use up excess zuchinis & old bananas :) They got the two miniature thumbs up from my 2 yr old. Mine weren’t overly moist, maybe the smaller muffin size, or the lack of syrup? Perfect muffins, especially since we haven’t found another recipe that fits his needs. Thank you! This came out of the oven about three minutes ago, and made it into our mouths about fifteen seconds after that. Pretty damn good! We subbed honey for maple syrup since we’re out of the latter, and I doubled the recipe to sneak some Enjoy Life chocolate chips and pecans into the grown-up recipe – the two year old gets the chocolate-free version. Pretty good Mother’s Day treat! Thank you! I’m unsure if my zucchini was still too wet because my bread is verrrrrry wet. The outside is cooked very brown but not so good inside. I did use one big loaf bread instead of two and maybe I needed to lower the heat and put it in for longer. Any suggestions? Thanks! It still tastes great! If you used 1 big pan instead of 2 smaller ones, the result is definitely going to be different especially if you didn’t adjust the baking time. Make sure the zucchini is drained and squeezed of any excess water, but I’m betting the pans/cooking time is more of the issue. Thank you for this recipe. I made it with a few tweaks of my own and it came out SO GOOD. I added a copule tablespoons of cocoa powder, subbed the last half cup of almond flour with 1/4 cup coconut flour, and used honey in place of maple syrup because I ran out. I live by myself and this loaf was gone within three days. I could not. Stop. Eating it. Thank you! Also, I used one bigger loaf pan, and extended the baking time by 5-10 minutes – I kept poking until my knife came out clean. This is wonderfully delicious! I used a regular size loaf pan … kept the temp at 350 and baked for 40 minites… it deflated slightly while cooling but is moist and yummy and not overly brown. Thank you for the recipe! I love finding alternatives to wheat flour and refined sugar and baking something delicious I can enjoy with my morning coffee! I loce this bread … I am making it again for a gluten-free friend … swems obvious but it is gluten free right??? thanks so much! I made this recipe this morning and it’s very good. I used two mini-loaf pans. It’s probably a bit too much batter. Despite greasing the pans really well the loaves baked up over the sides so they ended up sticking to the pans – which to me is a little annoying. I want baked goods that taste good and look good. Make sure to only fill the pans about 2/3 – 3/4 of the way. I didn’t have mini loaf pans so I used a muffin pan and baked for 20 minutes and until internal temperature was 202 – 204 degrees and toothpick came out clean. They were way too moist and definitely not sweet enough. Had to sprinkle them with Stevia. If I make them again I will substitute honey for maple syrup and maybe add some potato starch and Stevia. They did rise nicely though. I just made this. This is great bread! I substituted the maple syrup for one packet of stevia/lo Han and it was just right. I was worried about the banana, I don’t like banana bread, but this doesn’t have too much banana flavor. Just wonderful!!! This is a keeper! Can I sub some the banana with apple sauce? And if so how much? I just printed this out and sooo excited to try it! Even though me and my bf are big Paleo geeks. We are missing our breads! This would’ve went awesome with my spinach avocado soup garnished with bacon and goat cheese (AMAZING!) last night. I only have almond meal at home. I know they are both the same thing only almond meal is more coarse. Would it work the same?? Is there any way of making this recipe with the eggs? My daughter has an egg allergy so those aren’t an option for us… I need to keep ťhe recipe gluten free, dairy free, yeast free and egg free. I’m also at high altitude. Hope you can help. Tiffany- I haven’t tested this recipe with egg substitutions but here are a couple of articles with suggestions on how to do it: http://www.thekitchn.com/vegan-substitutions-for-8-common-baking-ingredients-171165 and http://www.egglesscooking.com/egg-substitutes/ I’m really not sure how any would work as paleo baking recipes are kind of finicky as is and I’ve never tried them without eggs but you could give one of those methods a shot based on what works for your family. Unfortunately, I have no experience in high altitude baking so I really can’t comment or give you any suggestions on that part. Good luck. Wow! 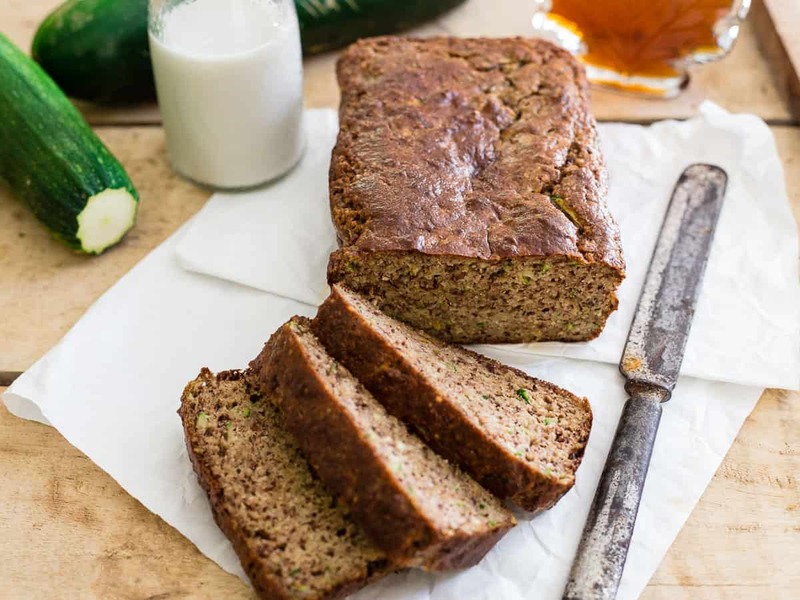 This the best paleo zucchini bread I have made! Moist and the right amount of sweetness. I had to sub honey for maple as that is what I had on hand, but otherwise followed to a T. Thanks for sharing! LOVED this recipe!!! Turned out great! I’m making it the second time today…yum yum yum! Ohhhh myyyy! I just made these thiis morning and all I can say is…. Scrumdilyicious!! I’ve now made this several times and it’s great. I have seldom had paleo/gluten free recipes from blogs turn out well, but this bread is excellent. The only change I’ve made is using honey instead of maple syrup, which I suspect makes the end result slightly sweeter-tasting, since honey is sweeter; also, once or twice the batter was far too wet (probably a function of how well-squeezed the zucchini was) so I added a couple of spoonfuls of gluten-free flour on those occasions. Good results every time. Another thing I’ve done is bake some of the batter in mini muffin tins – this helps the rise sustain itself even better. A clarification that might be helpful: is the grated zucchini measured out as one cup before or after squeezing? I think after, since I did that and it turned out well. Oops – failed to put in the 5 stars this recipe deserves on the last comment. I made this for breakfast for my wife and I. We have a ginormous zucchini from a farmer-friend and only used a quarter of it for this bread. MMMMmmmmMMMM! I added a touch of vanilla extract and ground almonds into a flour consistency. I ran out of almonds so I used a little shredded coconut that I processed into flour and a little tapioca flour. Also, I don’t eat bananas regularly and substituted the banana with an egg. So moist, not too sweet, fluffy texture. Don’t use chia eggs unless you want to try doubling the baking time. I seem to be the only one with this problem. Is the zucchini measured before or after squeezing the water out? I am shredding right now so I doubt I will get a response in time to know. I am going to squeeze and then measure. Measure after the water is squeezed but it really shouldn’t have too much of an effect on the final outcome. Hope you liked it! So I adjusted this recipe to make muffins (9 total) using the pulp leftover from juicing beets, carrots, apples, and celery. IT WAS SO GOOD! I like muffins that are savory and somewhat sweet, and these were absolutely everything delicious. Doing a nutritional breakdown was a little bit of a buzzkill though since these are high in fat and sodium. Next time around, which will be soon since I still have plenty of juicing pulp leftover, I’m going to exclude the salt and oil, and substitute 1/2 C of the almond flour with besan. Just made the zucchini bread, delicious! I did beat the egg whites separately as Cheryse suggested & it came out perfect! Thank you! Could I add cocoa powder to this recipe? Yeah, I’m sure you could. Haven’t tried it though, let me know how it turns out if you do! Oh my gosh…delicious! I made 9 muffins….it’s going to be a struggle for me to save some for the hubby to try tomorrow. Yum…. Omg. Made this for brunch today. Followed the recipe exactly and got the most perfect bread imaginable. Made some whipped maple butter on the side to top it. Sent the recipe to family and friends. My husband raved about it!! Yay! So glad you liked it. That maple butter sounds like an amazing complement to the bread! Would cassava flour work in place of almond flour? I’ve never baked with cassava flour so I’m not totally sure but I bet it probably would. Please let me know if you do! Sounds delicious! 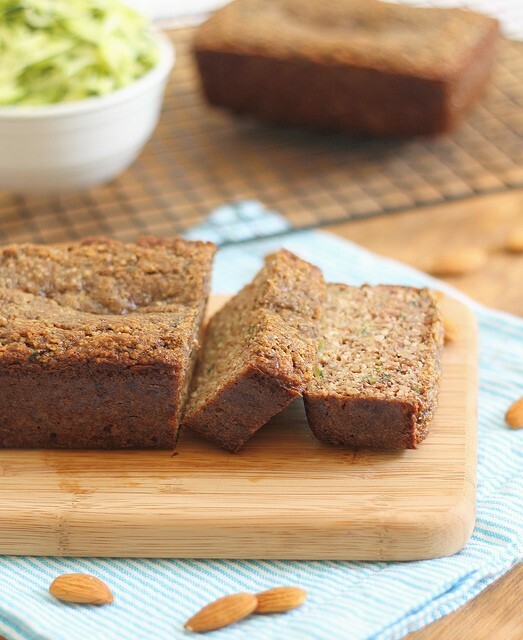 I absolutely love paleo almond zucchini bread so will have to try to make these. This looks great! I know you have a chocolate zucchini bread recipe, but do you think I could adapt this recipe to make it chocolate? If so, and you don’t mind, how much cocoa powder would you suggest I add? Thanks! This turned out really well for me! Thank you! I love the combination of banana and zucchini and the maple flavor is wonderful!! It is definitely moist, but I find that to be the case with paleo type breads. Bake time was spot on for my oven. I used a regular loaf pan. I love the simplicity of this recipe!!! I just found your recipe and it was just what I was looking for. Just whipped up two loaves and there in the oven now. It was so easy and. I have a lot of zucchini shredded up. Just ran out of almond flour. Thanks for the recipe. I made the zucchini bread and tweaked it to my taste and also took advice from other comments. This bread is moist and yummy! I added more maple syrup (I like a sweater bread) and also added chopped walnuts, chopped dates and cocoa powder. Instead of added all of the eggs, I added the yolks, then I whipped the egg whites and folded them in for a lighter bread. I baked at 325* for about an hour. Turned out GREAT. Thank you for your recipe! I had great success with this recipe, also with a few variations. Instead of maple syrup, one extra banana and six drops of vanilla stevia. Also I used duck eggs, which can create a more fluffy texture than chicken eggs, I’ve found. Otherwise I followed the directions exactly. The end result was firm but moist and very flavorful. My non-paleo and sugar-happy roommates were impressed. Delicious recipe! My kids loved it too which is always a win. I did not find an issue with it being too moist, it was just perfect. I added a small apple too.